The Flop: Anderson sued Graton Rancheria for $43 million, only to be penalized to the tune of $725,000. Sonoma County resident Darius Anderson is one of California’s most powerful men. For decades he has advised and raised campaign funds for prominent state Democrats, including Willie L. Brown, Nancy Pelosi, Jerry Brown, Dianne Feinstein, Barbara Boxer, Gavin Newsom and Kamala Harris. Anderson’s Sacramento lobbying firm, Platinum Advisors, advertises that it generates “billions of dollars in work for our clients” by navigating their deals through mazes of government bureaucracy. Anderson’s Kenwood Investments is developing Treasure Island in San Francisco Bay, in partnership with public and private entities. But one deal Anderson tried to navigate more than a decade ago ended with a finding of fraud directed at another investment company owned by Anderson, Kenwood No. 2. Anderson, 53, is the managing member and chairman of Sonoma Media Investments, which owns the Press Democrat and its affiliate publications. He promotes himself as a champion of liberal social causes, a philanthropist, a public servant, a man of integrity who cares about his community—especially racial minorities. That image has not survived judicial scrutiny. After a two-month arbitration trial ended last November, three retired state judges declared that Anderson and his partners in Kenwood Investments No. 2 LLC (“Kenwood No. 2”) defrauded a Sonoma County Indian tribe between 2002–03. They ordered Anderson’s investment firm to pay $725,000 to the tribe to cover its lawyer’s fees and arbitration costs. In a settlement arrangement, Kenwood No. 2 agreed not to appeal the judges’ findings, and the Graton Rancheria agreed to let Anderson’s firm pay less than the dollar amount of the award, says Joel Zeldin, the tribe’s arbitration counsel. According to the arbitrating judges, Anderson breached his consulting contract with the tribe, which now owns the Graton Resort & Casino in Rohnert Park. The judges found that Anderson and his associates “fraudulently induced” and “breached” an agreement to assist the tribe in developing a Las Vegas-style casino business. The ruling, by retired Superior Court judges William Cahill, Read Ambler and Richard A. Kramer, concluded a long legal battle between Anderson and the Graton Rancheria. It shed light on a powerful man who, the judges ruled, sought to enrich his business at the tribe's expense. The judicial proceedings took place behind closed doors at the San Francisco office of the JAMS mediation organization. A final binding arbitration award was issued by the judging panel this year, on April 26. It was confirmed by Superior Court Judge Richard Ulmer on June 1. The 53-page arbitration report details how Anderson and his associate, Douglas Boxer, harmed the Graton Rancheria in multiple ways, including the loss of millions of dollars. Boxer was a lobbyist for Platinum Advisors and Anderson’s partner in Kenwood Investments No. 2. He is the son of former U.S. Sen. Barbara Boxer, who, in 2000, wrote federal legislation that restored the national sovereignty of the Federated Indians of Graton Rancheria and authorized the tribe to establish a casino business. In early 2002, Anderson and Boxer approached the tribe’s chairman, Greg Sarris, a novelist and professor of creative writing and Native American studies at Sonoma State University. They proposed that the newly empowered tribal nation hire Platinum Advisors to help it acquire reservation land and start a business to make it self-sufficient. Anderson and Boxer told Sarris that Platinum Advisors had “significant real estate development experience and connections with local, state and federal politicians,” according to the arbitration award. They proffered a platform of consulting services for a monthly retainer of $1,000, with payment deferred and contingent upon success. Sarris trusted Boxer because the lobbyist’s mother had sponsored the legislation that re-established the tribe’s sovereignty. After Anderson presented a promise-filled PowerPoint to the tribal council, it voted to hire Platinum Advisors. Fifteen years later, arbitrators declared that Anderson and Boxer had breached their contract to deliver adequate professional services in the tribe’s interest, damaging the casino project’s prospects. Kenwood No. 2 received $1.2 million in cash payments at the expense of the tribe, the arbitrators found. According to the arbitration document, the Graton Rancheria was afraid to expose these actions when it discovered what Anderson was doing in 2003, fearing political retaliation by the consultants. The story only came to light because in November 2013, Anderson demanded that the Graton Rancheria pay Kenwood No. 2 a percentage of the projected revenue from its recently opened casino. Anderson insisted that the tribe pay his firm $43 million; he threatened to compel arbitration if it refused. The tribe refused. It sued Kenwood No. 2 in state superior court, claiming that its sovereign immunity prohibited Anderson from compelling arbitration of his claim. In November 2015, the court ruled that the tribe had waived its sovereign immunity defense in its contract with Anderson. In 2017, that judgment was affirmed by the appellate court, and the JAMS arbitration commenced. Anderson claimed 2.5 percent of the Graton Resort & Casino’s net revenue for the first seven years of its operation, despite the fact that after 2005, the tribe had ceased doing business with his company. Insisting that the Graton Rancheria had “unjustly enriched” itself at the expense of his firm, Anderson demanded that it pay his attorney fees, too. The two trials generated thousands of pages of testimony, depositions and exhibits. The court record of the arbitration award was partly redacted and relabeled at Anderson’s request, according to Zeldin. Anderson’s and Boxer’s names are replaced by “Person A” and “Person B,” respectively. “Platinum Advisors” is replaced with “Company 1.” “Kenwood No. 2” replaced “Kenwood.” The names of politicians and descriptions of their actions are blacked out. But who they are and what they did is clear from the narrative context and from contemporaneous news reports. In March 2002, the Graton Rancheria signed a contract with Platinum Advisors as its “exclusive agent” to provide it with “strategic advice and consultation” and to develop “political visibility.” The contract granted Platinum a right of first refusal to “partner with the tribe in any business opportunity it pursued.” The idea was to attract investors. From the get-go, Boxer worked to convince the tribe how “‘much of a home run a casino would be’ rather than organic food processing, grape growing, strip mall, or senior assisted living facility,” according to the arbitration award. It did not take much convincing. Casinos attract cash like black holes eat planets. Even as Anderson and Boxer worked with the tribe on a public relations campaign to further a casino project, they were making secret deals to benefit themselves, the arbitrators found. According to a declaration filed by Anderson in 2015, he, Boxer, Jay Wallace of Platinum Advisors and Stuart Sunshine, a San Francisco city official, created Kenwood Investments No. 2 LLC in January 2003. The arbitration judges ruled that Anderson’s new company shadowed Platinum Advisors’ tribal consulting activities, while serving a hidden agenda to make money for its principals—at the tribe’s expense. Without informing Sarris or the tribe, Anderson and Boxer struck a deal to buy 1,736 acres of tidal wetlands near Highway 37, a major road connecting San Francisco and Oakland. Kenwood No. 2 paid $100,000 for an option to purchase the swampy property, which it sold to the tribe for $750,000. As Kenwood No. 2 was secretly securing the option, Platinum Advisors was advising the tribe to select the Highway 37 site for its casino, even though it was a politically impossible place to pour acres of concrete. “The site was part of 50,000 acres of tidal wetlands that conservationists had been trying to protect and restore since the 1970s,” noted the arbitration judges, who were incredulous that Anderson had suggested it. The attempt to locate the casino on the wetlands site proved to be a public relations and monetary disaster for the tribe. As Anderson and Boxer were negotiating to buy the swampy land in late 2002, they were also negotiating casino-management deals with several Las Vegas–based casino operators, including Station Casinos, Harrah’s, Maloof and MGM, without telling the tribe. In February 2003, Anderson sent a request for proposals (RFP) to potential casino operators. The proposal represented Kenwood No. 2 as the “exclusive development partner” and “financial advisor” for the tribe. It stated that Kenwood No. 2 would evaluate the proposals and select the casino manager for the tribe. Kenwood No. 2 had no contractual relationship with the Graton Rancheria when it issued the RFP. The tribe’s contract was with Platinum Advisors. •	The operator would commit to buying Kenwood No. 2’s option to purchase the Highway 37 land and then buy the land from the seller on behalf of Kenwood No. 2, which would be the “titleholder.” The RFP assumed that the casino would be built on the Highway 37 site controlled by Kenwood No. 2 and that there were no other possibilities. •	The operators would pay Kenwood No. 2 “development fees” of $2.5 million up front to purchase the option on the Highway 37 site, and another $2.5 million when the tribe took over the site—$5 million total. The operators were not required by the RFP to make upfront cash payments to the tribe, or to provide any specific amounts of money for the tribe’s maintenance costs (i.e., its ability to maintain its existence until the casino began generating revenue). Anderson received and evaluated four responses to the RFP, which he did not share with the tribe. Notably, Harrah’s proposed to take up to 24 percent of the net gaming revenue as its management fee. Improving on the terms of the RFP itself, Harrah’s offered to pay $100,000 a month to the tribe for the casino’s maintenance, along with $4 million pre-development fee. Harrah’s also offered to donate $100,000 per year to set up an educational scholarship fund for tribal members. And it offered to make a one-time $25 million Quality of Life loan to the tribe. Harrah’s declined to pay a percentage of net revenues to Kenwood No. 2, although it offered to pay Anderson $50,000 a month in consulting fees, if the tribe approved of the arrangement. Harrah’s pointed out that such an arrangement was not normal business practice; it would have to be approved by the National Indian Gaming Commission. Harrah’s expressed concern about the truth of Anderson’s claim to be representing the tribe’s interests. It asked to be put directly in touch with the tribal council before proceeding further. Anderson rejected Harrah’s proposal without consulting with Sarris and the tribe or informing them of the proposal’s existence. Station Casinos’ response to the RFP was far more favorable toward Anderson. It suggested that Kenwood No. 2 and Station Casinos partner to manage the casino. It proposed divvying up 30 percent of the casino revenues—20 percent to Anderson, 80 percent to Station. The Las Vegas–based corporation offered to pay Anderson $10 million cash up front and $15,000 a month for consulting services. It offered $100,000 a month for tribal maintenance, but it did not offer the tribe any development fees, scholarships or loans. On March 7, 2003 Anderson and Boxer asked the Graton Rancheria to assign the Platinum Advisors contract to Kenwood No. 2, and claimed it would not change the terms of the agreement. But the assignation did change the terms of the agreement. The new arrangement gave Kenwood No. 2 new authority to act as the tribe’s exclusive agent. Kenwood No. 2 was allowed to negotiate a cut of the casino operator’s management fee for itself. And, importantly, the tribe agreed to waive its sovereign-immunity defense in the case of a contract dispute—a concession it later regretted. Anderson and Boxer had been negotiating with gaming corporations since the fall of 2002. They first told Sarris and the tribe that they had issued RFPs on March 11, 2003. Brian Campbell, a tribal member doing legal work for the tribe, got wind of the RFP and asked Boxer for a copy. Boxer gave Campbell a copy but did not tell him about the responses that had been received. Boxer later testified under oath that he had given drafts of the RFP to the tribe before it was sent out in 2002. The tribe’s witnesses testified that Boxer did not do that. Campbell testified that he was surprised that Anderson had asked for 10 percent of the gaming revenues and $5 million in upfront fees in the RFP. On March 14, 2003, Anderson told the tribal council about the existence of RFP responses. He did not disclose Harrah’s offer to the tribe of tens of millions of dollars in cash. Even as members expressed outrage at Anderson’s self-dealing behavior, the tribal council accepted his recommendation that Station Casinos be selected as its casino operator. Suspecting that Anderson was more motivated to benefit himself than the tribe, the Graton Rancheria hired attorneys from California Indian Legal Services (CILS) to watch over its interests. The CILS lawyers noted that it was a conflict of interest for Anderson to negotiate with Station on behalf of the tribe while he was also negotiating with Station on his own behalf for a cut of the management fees. Anderson agreed that he would not negotiate a separate deal. On April 22, 2003, the tribe signed the revised agreement with Kenwood No. 2. It provided that Anderson’s company would receive 4 percent of the net gaming revenues for seven years (later reduced to 2.5 percent). Anderson agreed to donate $25,000 annually to the UCLA College of Indian Law Program. The next day, according to trial exhibits, Anderson secretly made a separate consulting agreement with Station Casinos, despite his promise that he wouldn’t. Kenwood No. 2 contracted to assist Station Casinos “maintain its relationship” with the tribe. Station Casinos agreed to pay Anderson $20,000 per month as it bought the option on the Highway 37 site for $750,000, netting Kenwood No. 2 a $650,000 profit. Station Casinos agreed to pay Anderson a total of $9.5 million for achieving various “milestones” as it helped the tribe to navigate the bureaucracy of getting its casino up and running. Anderson did not tell the tribe about his side deal with Station Casinos. “The evidence indicates that Kenwood No. 2 intentionally kept information regarding the Station/Kenwood No. 2 agreement secret from the Tribe,” the arbitrators found. “[Exhibit] 490 [Douglas Boxer] notation: ‘don’t tell Sarris: negotiation.’” Boxer did not respond to multiple requests for comment. In fact, they did not learn of the secret side agreement’s existence until June 2003, when Station Casinos included a copy of the side agreement in the paperwork accompanying its negotiations with the tribe, the arbitrators found. Station Casinos declined to comment. On the same day they signed the side agreement, Station Casinos and Anderson announced that the Graton Rancheria planned to develop the Highway 37 site for a casino. A coalition of environmental groups that supported the Bay Delta Restoration Plan to restore local wetland habitats enlisted local, state and federally elected officials to vehemently oppose erecting the casino. The tribe’s attempt to “appease these groups by offering to restore hundreds of acres of wetlands on the property” was a non-starter. After Sen. Feinstein “threatened to redraft the Tribe’s restoration language to obstruct the Tribe’s ability to open a casino anywhere,” the Graton Rancheria backed down and nixed the wetlands as a possibility. The tribe ended up paying for and donating the Highway 37 wetlands to the Sonoma County Land Trust, which has restored it. The wetlands debacle ended up costing the tribe about $5 million, which included paying for the unusable land and for Kenwood No. 2’s profit on the land-purchase option. Without Anderson’s assistance, Sarris and the tribe went looking for an alternative site to build their casino, and eventually bought 270 acres in Rohnert Park for $100 million. The tribe had little or no contact with Anderson and Boxer after 2005, when it stopped using their services. The arbitrators determined that lobbying on the tribe’s behalf violated California law because Kenwood No. 2 was not a registered lobbying firm. 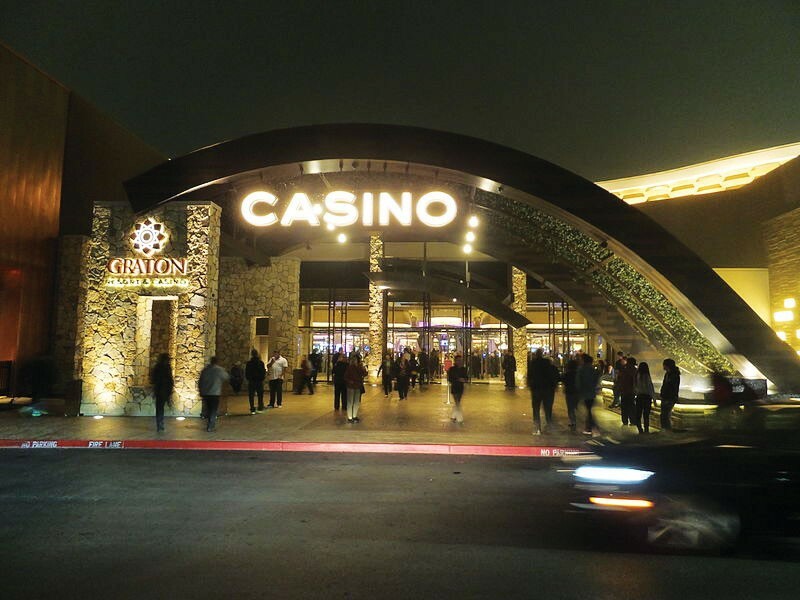 Regardless, the judges found that Anderson and Boxer did not materially assist the tribe in jumping through the complicated governmental, environmental and financing procedures necessary to obtain a gaming compact and open the casino. The tribe estimated that it ended up paying Kenwood No. 2 $10,000 an hour for the services it did receive before the contract ended. Nonetheless, the tribe invited Anderson and Boxer to attend the opening party for the Graton Resort and Casino on November 5, 2014. That same day, Anderson demanded that the Federated Indians of Graton Rancheria wire a payment of $43 million to his bank account. •	Kenwood No. 2 breached its contract when it bought an option for the Highway 37 land without telling the tribe, and then promoted the land to the tribe as suitable for the casino site despite its unsuitability for development. •	Anderson and Boxer sent out request for proposals for a casino manager that benefited Kenwood No. 2 at the expense of the tribe and without telling the tribe of the existence of the RFPs. •	They rejected Harrah’s proposal without telling the tribe or informing it about Harrah’s reservations regarding the RFP terms, including concern about Anderson’s option to buy the Highway 37 site and his consulting-fee demands. The judges ordered Kenwood No. 2 to pay the tribe’s attorney fees and costs of $725,657.48, and to receive nothing for itself. Anderson did not respond to multiple requests for comment.